I have had my 55 gallon set up for quite a while now. I have made many upgrades to equipement to make sure everything is where it should be. I do water tests 2x a week. Everything looks good. Up until now I have not been concerned withcalcium levels, but I di just add some soft corals, and some mushrooms. So, tonight when I did my testing I researched calcium. I am showing my calcium at 600. I know there is calcium in my tap water that I use for water and there is calcium added to the salt I use. I want to make sure that it is not harmful for my fish, corals, and other things in the tank. It is some high but do me a favor and make a batch of SW and then test the batch water to see what the calcium is before you add it to the tank. Are you using tap water for your Reef? Yes, I am using tap water. There is nowhere around here that sells or even uses ro water systems. I have done a bit of research. My tap water has a calcium level of 180ppm. I tested it alone. The salt we are using states that is make the water 400 ppm for calcium, and that was if it was added to ro water. so If I combine the two I am pretty much the level i have. I just had to purchase new salt and I di not get the High in calcium for reefs salt. 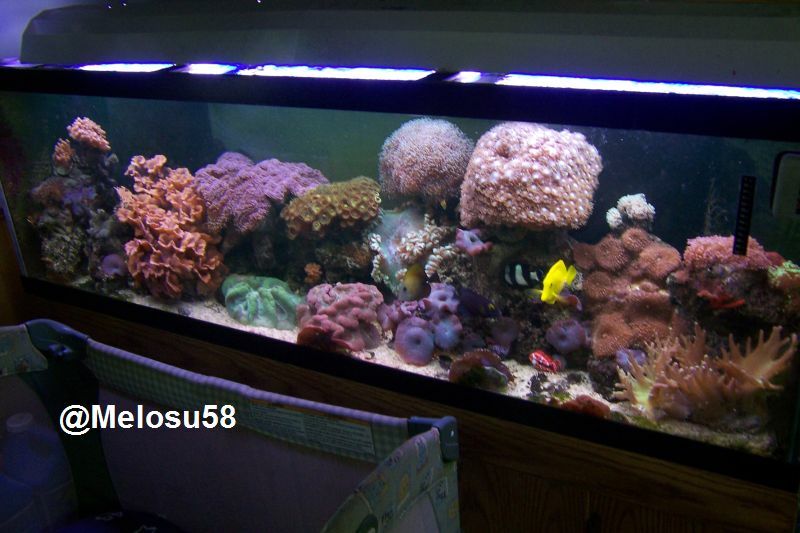 We do have or plan to have any hard corals. I hope I am on the right track. Do any of the grocary stores near you have water vending machines? Those would basically provide you with RO although it'd take quite a few gas cans or jugs..
What is the Ca level of the PWC water with the new salt? This change in salt may be what you needed. If you are serious about getting into SPS, then you should get a RO/DI unit. After a quick onversation hubby and I realized we have a great place for getting ro water. Our restaurant has a system that triple fiters the water before it goes through the soda and ice machines. He can bring some home with him! Triple filtering isn't the same as RO. While it's probably better than tap, don't think it's pure. oh well I tried. I knew it wasn't exactly ro water, but it should be better than my tap. All the reading i have done both online and in book, does not state that high calcium is a problem. In fact ususally the issue is the oposite, being not enough calcium. I have not read that it could be harmful to my fish, live rock, sand or corals. So, I am not sure if I just leave it alone or what. You can pick up a RO/DI unit on Ebay for less than $125. Thats what I would do if I were you. Not only to bring down your calcium level but it will also help to keep algae under control in the future. In regards to calcium being to high I think it is kind of like us taking too many vitamins. It is not going to hurt you but the extra vitamins or calcium in this situation, is also not going to be any added benefit either. I have heard that if calcium gets too high you can actually see it floating in the water in a more "solid" form. I repeat! What is the Ca level of the PWC water with the new salt? If calcium levels get too high (over 500ppm), there is a tendency for alkalinity to drop. So what is your Alk Reading like. Also your Mag readings as these all interact with each other.